What are the big differences between surrogacy in the United States and Canada? The United States, together with Canada, is one of the safest countries for pursuing a surrogacy process abroad. The favorable legislation non-residents find in many states is one of the main reasons why foreign prospective parents travel to the US and Canada in order to have their baby through a surrogacy process. But… what are the main differences between both countries? The practice of surrogacy in both countries is legal, although there are differences in the types of surrogacy allowed depending on the state/province. Commercial surrogacy is legal in some states in the US, whereas other states allow only altruistic surrogacy and some forbid surrogacy altogether. In Canada, as per the Assisted Human Reproduction Act passed in 2004, it is illegal for a surrogate mother or egg donor to be compensated for her services, except for the reimbursement of out of pocket expenses related to the pregnancy during the surrogacy process. The fact that surrogacy agreements must be 100% altruistic makes the number of women willing to be surrogate mothers to be a small one. 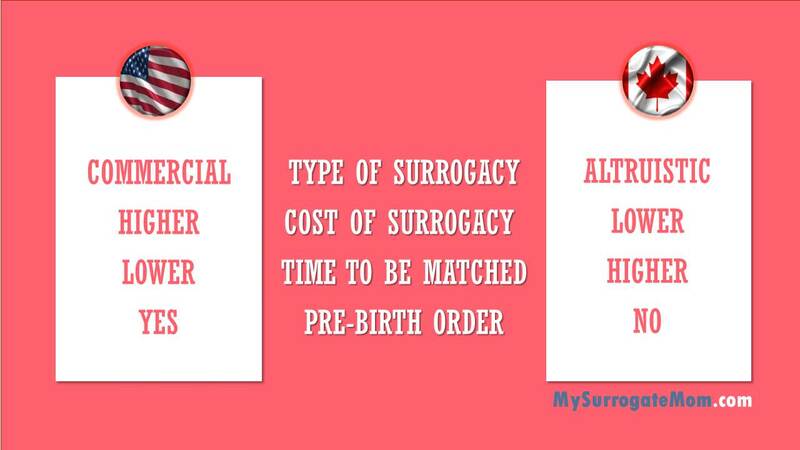 In both countries, you will need to wait to be matched with a surrogate. Usually, there are more intended parents than surrogates ready to be matched. In the U.S. a typical waiting time for finding a surrogate is from 3 to 6 months, while in Canada, due to the shortage of gestational surrogates the waiting time could be much longer, sometimes as long as a year. 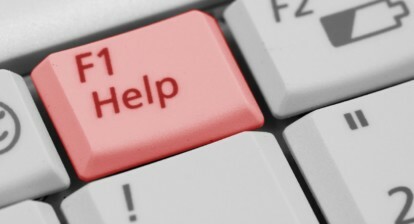 Health care system: in the United States, contrary to Canada, there is no national public health care service covering both the surrogate and the delivery, so if you pursue a surrogacy process in the United States, you need to consider the costs of insurance premiums to cover the medical treatment during the pregnancy. Surrogate compensation: as previously mentioned, surrogacy in Canada is altruistic. This means that it is illegal to benefit commercially from surrogacy. However, the surrogate is allowed to get reimbursements for expenses. As a result, compensations in Canada are typically lower than in the United States. In the US, on top of reimbursements, surrogates charge an amount for their service. Surrogacy agencies: In Canada, surrogacy agencies are not technically legal, they cannot match intended parents with surrogates because according to the law the responsibility to find a match is under the intended parents. Despite legal limitations, Canadian agencies navigate the laws to support intended parents and surrogates during the surrogacy journey. The legal restrictions in Canada make the process, to some extent, less straightforward than in the US where a surrogacy consultant can manage the whole process. On the other hand, as commercial surrogacy is allowed in the United States, there are a larger number of surrogacy consultants established in the country in comparison with Canada. Besides, they have a higher degree of professionalism at the same time that offers more complete packages than Canadian consultants. This means that American agency fees are typically higher than Canadian ones. In the US and Canada, there are clear regulations and procedures for the intended parents to be registered as the legal parents of the baby. However, the legal process may change depending on the State/Province where the surrogate lives. On the other hand, unlike in some U.S. states, in Canada, the surrogate holds the parental rights upon the baby’s birth, because there are no “pre-birth orders”. 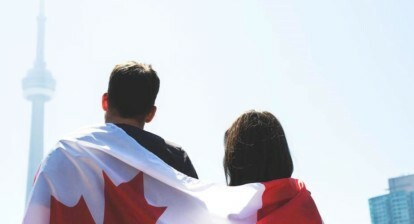 There are similarities but also important differences between both countries, and even if surrogacy is legal in some U.S. states and Canadian provinces, it’s important that you get in contact with a family lawyer and/or a surrogacy consultant specialized in fertility to learn more about the particularities of surrogacy in Canada and the USA. Previous ArticleExploring the Differences between Fresh and Frozen Embryo TransfersNext ArticleWhat Is Traditional Surrogacy? 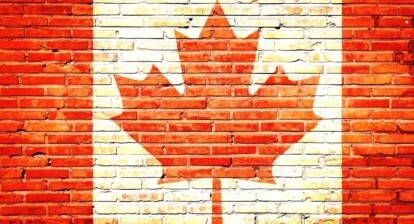 Surrogacy in Canada: What Intended Parents and Surrogate Mothers Need to Know!